Both honey and sugar are simple sugars. Once they enter your body, they absorb quickly and work quickly to elevate your blood sugar. While you may assume that sugar and honey are high on the glycemic index, they're actually both in the moderate, and in some cases, even low on the range. Foods with a high glycemic index rating -- above 70 -- generally make your blood sugar quickly go up and then rapidly drop back down in a short period of time. If a food has a moderate score, between 55 and 69, it will still raise your blood sugar, but probably not as much as something with a higher ranking. Ideally, all the foods in your diet should be low GI, with a rating under 55. These types of foods often keep your blood sugar stable for a while. Pure honey has a typical ranking of 58 on the scale. But some varieties are even lower. 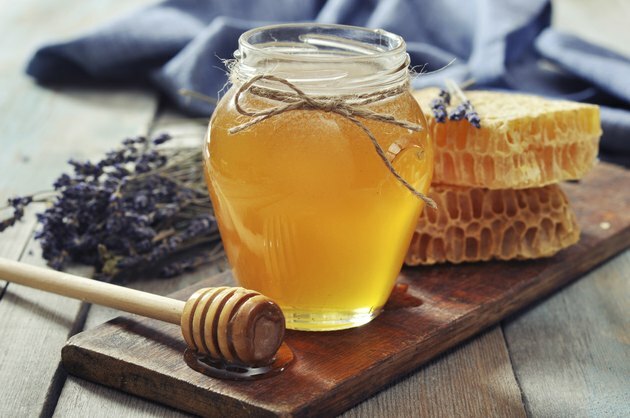 The glycemic index of honey depends on how much fructose is in that particular batch. Honeys that contain 35 to 45 percent fructose, for example, score around 35 to 48 on the glycemic index. White table sugar, also known as sucrose, is higher, with a glycemic index between 58 and 65.